Chop romaine lettuce and place in a large bowl, set aside. Heat olive oil in flying pan. Meanwhile dice chicken breasts into bite size pieces. Season chicken with salt, pepper, and garlic powder to taste. Sautee chicken till it’s no longer pink inside and the juices run clear. 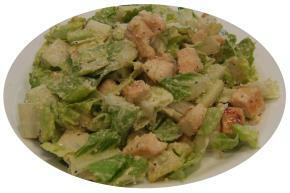 Add Caesar dressing and lemon juice to pan with chicken. Cook 5 min longer until dressing is heated. Pour mixture over romaine lettuce. Add croutons. Toss to coat. Transfer to plates and sprinkle with parmesan cheese. Enjoy.